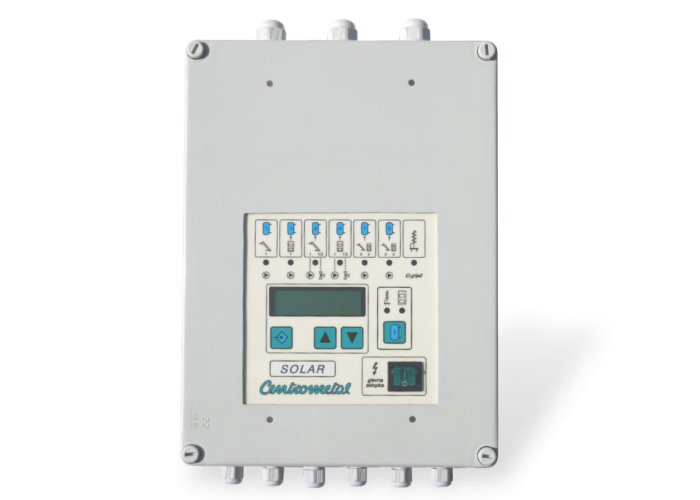 The solar regulator is engineered for steering the accumulation of energy produced in the solar collectors and/or wood firing boilers. It can also be used for domestic hot water (DHW) production with any other kind of boilers. The regulator has a built in protection system for water heater, collector and boiler. Titles of parameters and the possibility of their regulation, which means the setting of exclusively those parts, which are necessary for the chosen configuration, make the regulation basis easier. The function of the regulator is additionaly steered by present connected sensors. This means that the function of the whole configuration shall be fully satisfied in accordance with all necessary sensors needed for the distinguished configuration. In case the operation one of the sensors is interrupted, the regulator shall continue its work, using functions steered by other sensors. Collector circuit temperature regulation (max. 2 separated collector circuits). Boiler circuit regulation (max. 2 circuits: oil/gas/solid fuel (biomass) firing boiler circuit and solid fuel (biomass) firing boiler circuit)). Regulation of the additional accumulating hot water heater (i.e. TB hot water heater or CAS-S, -BS). All the above regulation functions are made by using circulation pumps or mixing valves. Regulation of the electric heater. Circulation pump protection for excess temperature. Display for reading relevant temperatures. Display of solar energy yield in kWh. Messages displayed in English language. LED-display of individual operating system elements. Delivered in a housing with all necessary sensors.